Rubber couplers are used to connect dock sections to one another. Use an In-Water Installation tool to pull the coupler up from in the water, connect the top rubber coupler and tighten with a composite nut. 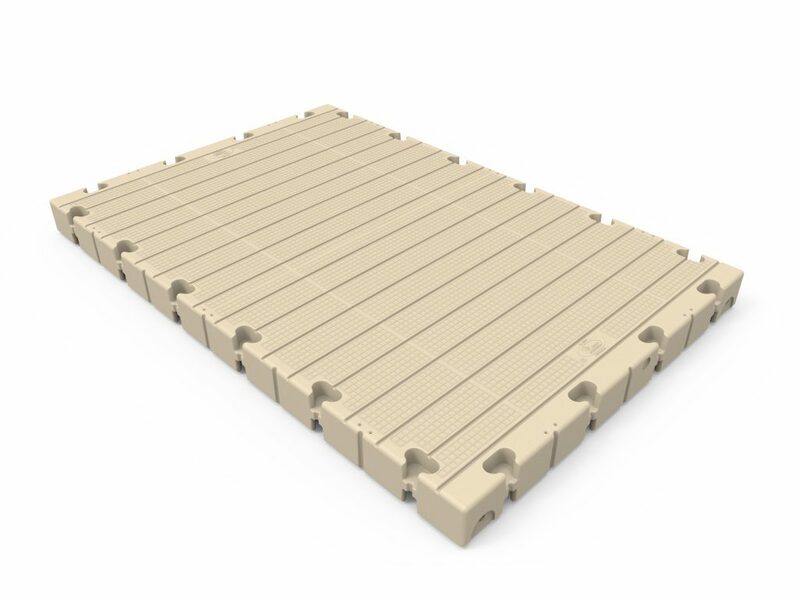 The walking surface of each dock section has an orange peel-type texture along with a raised pattern to provide slip resistance. The rubber coupler allows for all dock sections to be tightly connected to one another. Gap-free = no tripping. 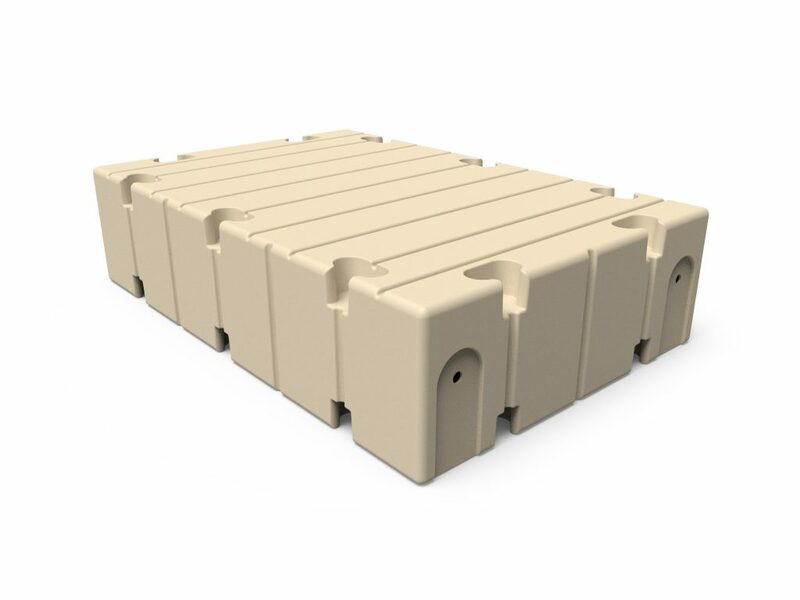 Available in beige and gray, EZ Dock looks great on any waterfront. The walking surface has an orange peel-like texture with raised grid pattern for increase slip resistance. 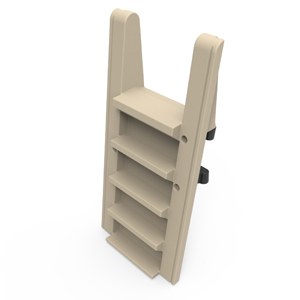 The patented flotation design on EZ Dock is what creates its tremendous capacity and stability. The underside of EZ Dock looks like a giant ice cube tray. You’ll notice flat areas and empty cavities. The flat areas (like a traditional dock) displace water, creating stage 1 of flotation. The open cavities trap air under the dock. These air pockets create additional capacity, but they also create stability. As you walk on the dock, there is a push and pull relationship between the air chambers. They are always working to keep the walking surface level. The two-stage system creates industry-leading stability and flotation capacity. There’s not much to maintain. A quick powerwash and you’re as good as new. If leaving your dock in year round isn’t an option, EZ Dock can easily be removed in sections for the winter and never requires any maintenance. No wood splinters, no nails or sharp objects. EZ Dock makes it remarkably easy to expand and change your dock system. The modular female pockets around the perimeter of each dock section allow you to easily add more sections and accessories. Did you get a new boat? Need some additional living space on your waterfront? No matter what changes or new configurations you need, we make it easy for you. 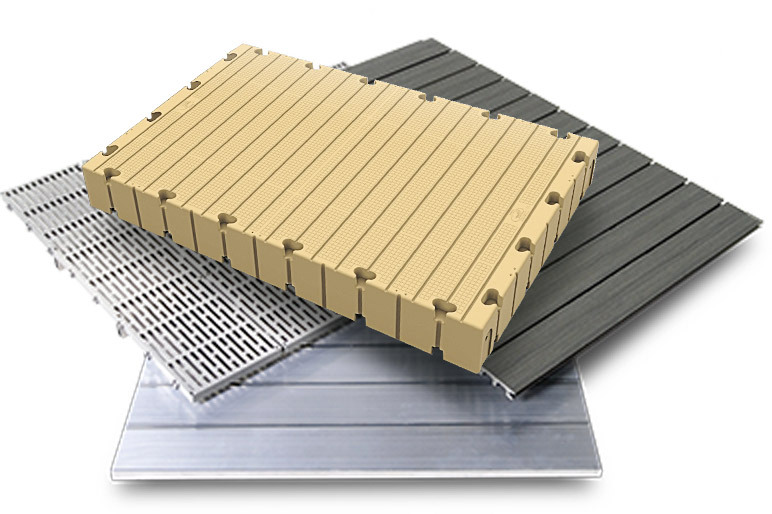 EZ Dock is designed to be eco-friendly and is a great alternative to wooden dock systems, some of which may use lumber that is treated with copper, chromium or arsenic. These lumber products can release harmful substances into their natural surroundings. EZ Dock does not require foam filling, which allows for filtered light penetration to the area below the dock. Our versatile, durable docks are perfect for residences, commercial and governmental uses; as well as for camps, parks, trail systems and more. The first dock of its kind and the last dock you will ever buy. For more than 25 years, EZ Dock has been designing and manufacturing cutting-edge dock products for all segments of the dock and lift industry. Our modular sections are available in standard and some custom sizes that enable you to design the exact layout for your ideal dock. Choose from many different sizes and shapes to get the exact dock configuration you desire. The pioneering EZ Dock system makes it a snap to install. 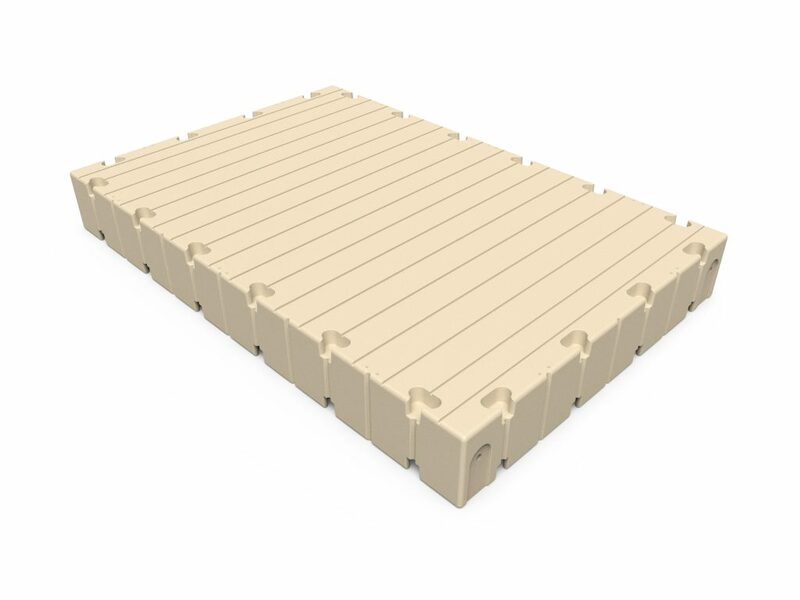 Standard sizes for our rectangular dock sections include: 40″ X 60", 40″ X 120″, 60″ X 120″ and 80″ X 120″. We also offer half-hexagonal and corner sections. Our versatile, winter-resistant EZ Dock system is ideal for a wide range of uses, including homes, marinas and commercial uses, camps and public parks, as well as countless recreational, governmental and industrial applications. Your boat isn’t made out of wood, so why is your dock? Use materials that make sense in the salt water. For over 25 years, EZ Dock has been providing saltwater dock solutions in some of the world's most aggressive waterways. Our state-of-the-art modular design enables you to assemble an endless variety of shapes, layouts and configurations — making it easy for you to design the ideal dock system for your unique waterfront needs. Your sales team was a tremendous help in walking me through your product lines and options. They helped make comments and suggestions and even sent me to a few local installations they had done. They all looked terrific. The docks are tremendous, but the company behind it is top shelf. The service and advice you gave me far outweighed any of the competitors I spoke to. I leave my dock in year round and haven’t had to touch it in five years. I get a ton of compliments and I can’t tell enough people on the lake about your company. I highly recommend spending the time and money to seek out EZ-Dock Northeast and FWM. Thanks again.